The wonders of graphene are many—it can improve solar cell capacity, enable flexible electronic components, filter the finest subatomic particles, and transform batteries. Now, the “supermaterial” may, in the future, be used to test for amyotrophic lateral sclerosis (ALS)—a progressive, neurodegenerative disease which is diagnosed typically by ruling out other disorders, according to new research from the University of Illinois at Chicago reported in ACS Applied Materials & Interfaces. When cerebrospinal fluid from patients with ALS was added to graphene, it produced a unique and different change in the vibrational features of the graphene compared to when fluid from a patient without neurodegenerative disease was added or when fluid from a patient with multiple sclerosis was added to graphene. These distinct variations accurately predicted what kind of patient the fluid came from—one with MS, ALS, or no neurodegenerative disease. Graphene is a single-atom-thick material composed of carbon. Each carbon atom is bound to its adjacent carbon atoms by chemical bonds. The elasticity of these bonds yields resonant vibrations, also called phonons, which can be highly accurately measured. When a molecule interacts with graphene, it alters these resonant vibrations in a very precise and quantifiable manner. Berry and his colleagues used graphene to find whether the cerebrospinal fluid was from a patient with ALS or multiple sclerosis—two progressive neurodegenerative disorders—or from someone not having a neurodegenerative disease. As there is no conclusive test for ALS, an objective diagnostic test would help patients start getting treatment sooner to slow the disease. Cerebrospinal fluid was gotten from the Human Brain and Spinal Fluid Resource Center, which banks tissue and fluid from deceased individuals. Berry, Dr. Ankit Mehta, assistant professor of neurosurgery and director of spinal oncology in the UIC College of Medicine, and their colleagues analyzed the cerebrospinal fluid from seven people without neurodegenerative disease; from 13 people with ALS; from three people with multiple sclerosis and from three people with an unidentified neurodegenerative disease. Berry is confident that graphene is picking up on the exclusive biosignatures—blends of proteins, and other biomolecules—present in the cerebrospinal fluid of individuals with different diseases. The electronic properties of graphene have been extensively studied, but only recently have we begun to examine its phononic properties as a way to detect diseases. 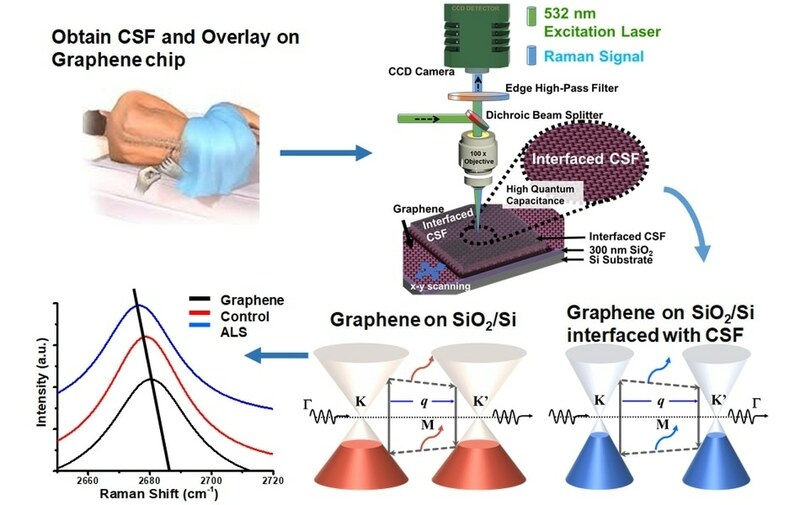 And it turns out that graphene is an extremely versatile and accurate detector of biosignatures of diseases found both in cerebrospinal fluids and whole cells. This study was supported by grant N00014-18-2583 from the Office of Naval Research, grant CMMI-1503681 from the National Science Foundation and a University of Illinois at Chicago Seed Grant.